Please note that the content of this book primarily consists of articles available from Wikipedia or other free sources online. 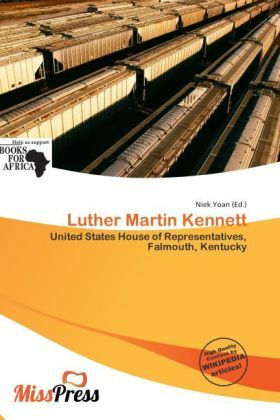 Luther Martin Kennett was a U.S. Representative from Missouri. Born in Falmouth, Kentucky, Kennett attended private schools. Deputy county clerk of Pendleton County in 1822 and 1823 and of Campbell County, Kentucky, in 1824. He moved to St. Louis, Missouri, in 1825. He was employed in a mercantile establishment. Later engaged in lead mining and the manufacture of shot in Jefferson and St. Francis Counties, Missouri. He returned to St. Louis in 1842. City alderman 1843-1846.